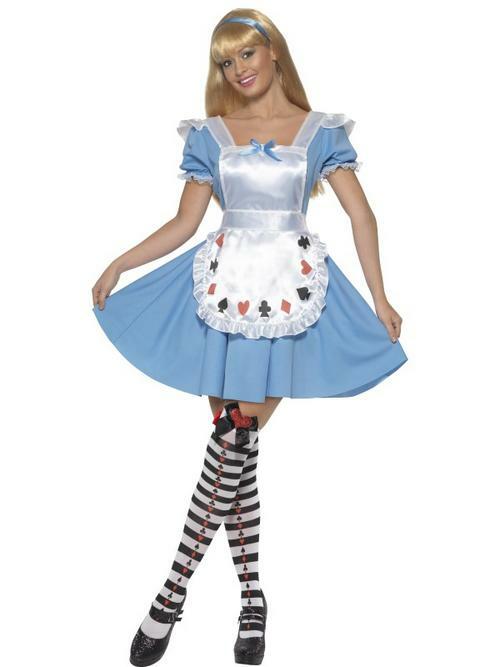 Enter into the dreamworld and go on an adventure with this delightful womans Deck of Cards costume. Whether you're partying with the Queen of Hearts or having tea with the Hatter himself you will look the part with this mesmerising take on the classic fairytale. Included is a delightful pale blue dress with puff ball elasticated sleeves decorated with a pretty frill trim and an attached white apron decorated with hearts, aces and spades on the front alongside a co ordinating frill trim finished with a pale blue ribbon bow to the chest. This Alice in Wonderland costume can be completed with one of our blonde Fairytale Wigs which can be found in our accessories section. This costume is great for book week, school plays and similar events and even makes a fantastic theme for a new year party costume. Why not take a look at the other characters we have available and recreate the whole cast, great for group events!